After deciding that the remote Woomera site was not ideal for a deep space tracking station, the search began for an alternative site. By the 1960s the growth of the National Capital was considered to be occurring at too slow a pace and pressure was placed on the Australian Government to remedy the situation. 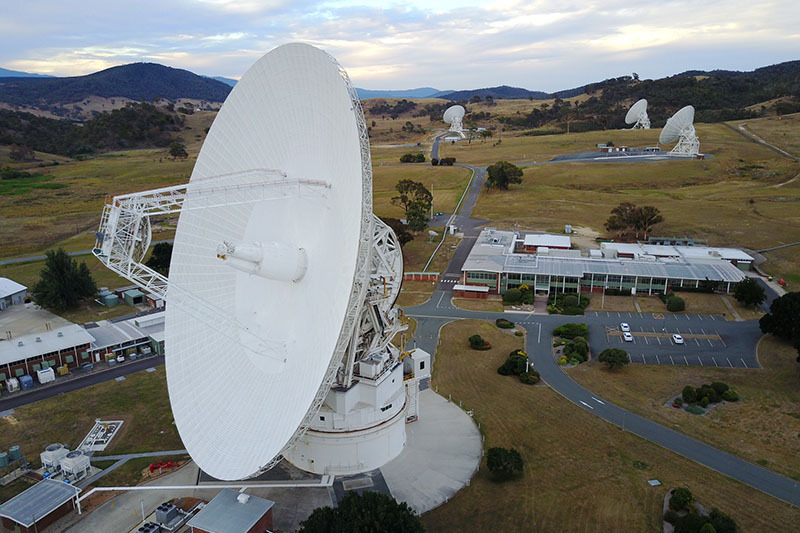 The decision was made to locate a new tracking station in the Australian Capital Territory in an effort to promote growth in the region. The Tidbinbilla valley, 35km south-west of Canberra, was chosen due to its close proximity to a growing city, with the surrounding ridges helping to shield it from unwanted radio interference. Construction of the complex began in June 1963 with operations commencing in December 1964, in time to support the Mariner 4 spacecraft encounter with Mars. The centrepiece of the complex was the 26-metre antenna (Deep Space Station 42). Two years later a crewed spaceflight wing was added to the complex to assist with the Apollo missions to the Moon. By 1970 the complex featured a power station, and facilities to manage the sewage and water supplies, while a cafeteria, and sleeping accommodation fed and housed the many workers on site. During early 1969 construction started on a new antenna. At 73 metres in height and weighing more than seven million kilograms, the then 64-metre antenna (Deep Space Station 43) took nearly four years to complete. The need for such an antenna was brought about by the increasing amounts of data received and the rapidly expanding distances that spacecraft were travelling. The new 64-metre antenna was more than six times as sensitive as the existing 26-metre antenna, and therefore could extend the useful lifetime of a spacecraft as its signal became weaker the further it was from Earth. During the 1980s the Voyager spacecraft travelled billions of kilometres to investigate the ‘gas giants’ Jupiter, Saturn, Uranus and Neptune. Over such distances, the signals from the spacecraft would be extremely weak and requiring more sophisticated equipment on Earth to receive them. Consequently, in 1980 the 26-metre antenna was upgraded to become a 34-metre antenna, improving the surface of the dish and adding higher frequency receiving capabilities. Similarly in 1987, the 64-metre antenna was upgraded to 70 metres in diameter. Even today, the 70-metre antenna is the largest steerable parabolic antenna in the Southern Hemisphere. When Honeysuckle Creek Tracking Station closed in December 1981, the 26-metre antenna was relocated to Tidbinbilla and renamed Deep Space Station 46 where it was used for spacecraft positioned close to the Earth. It was retired in 2009. In 1986 the construction of a new high efficiency 34-metre antenna (Deep Space Station 45) was completed to provide better reception at higher frequencies. The antenna was completed in time for the Voyager 2 encounter with Uranus, where it was used in conjunction with the 70-metre antenna to provide even greater sensitivity for the reception of signals. Deep Space Station 45 was decommissioned in 2016. In 1993 the GRO Remote Terminal System (GRTS) antennas, consisting of a 4.5-metre and an 11-metre antenna, were built to support the orbiting Gamma Ray Observatory (GRO) designed to communicate with Earth via TDRS. The GRTS antennas were fixed in place, and were occasionally used to support Space Shuttle missions and the Hubble Space Telescope as they passed over the Indian Ocean and Australia. The antennas were decommissioned in 1996. Radio Astronomy has benefited from new advances in arraying techniques. Arraying is electronically linking antennas at one or more locations to increase the strength of the signal. This Very Long Baseline Interferometry technique (VLBI) was expanded into space VLBI after the completion of the 11-metre antenna (Deep Space Station 33) in June 1996 (decommissioned in 2002). This antenna allowed communication with space based interferometer elements such as the Halca satellite from Japan. Such satellites work together with ground stations to simulate a radio telescope much larger than the Earth, increasing sensitivity. A 34-metre Beam Wave Guide antenna (Deep Space Station 34) was built in 1997. The antenna is very similar in structure to the 34-metre High Efficiency antenna (Deep Space Station 45), however the transmission and reception equipment is located underground. This reduces the weight on the dish, minimising the strain on the antenna structure. To ensure that the signal is focused onto the receiver the dish has a hole in the centre followed by a series of mirrors that reflect the signal downward. An added advantage of this antenna is that the receiving equipment located on the ground can undergo maintenance independent of the position of the dish. In 1998, after almost 35 years of service, the decision was made to decommission Deep Space Station 42. There were a number of contributing factors including discontinuities in its performance, metal fatigue in the structure, and significant non-repairable wear in the drive mechanics. The antenna was removed in 2000. Two additional 34-metre Beam Wave Guide antennas (Deep Space Station 35 and 36) became operational in 2014 and 2016 respectively.